This is the last election result to be posted until after the Thanksgiving holiday. Orange County Registrar of Voters Neal Kelley and his hardworking band of minions deserve a day off. 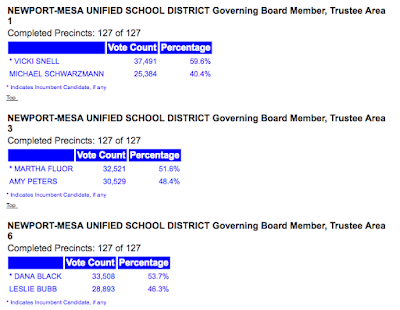 There remain only 48,836 Orange County votes remaining to be counted. According to the Election Results site, HERE, the next report will be on Friday afternoon. The positions in this remain the same. 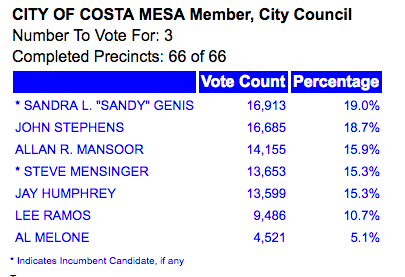 Incumbent Sandy Genis holds a 228 vote lead over John Stephens. He holds a commanding 2,530 vote lead over former Mayor Allan Mansoor. Mansoor holds a 502 vote lead over Mayor Steve Mensinger. Jay Humphrey is only 54 votes behind him. Lee Ramos and Al Melone are far behind. 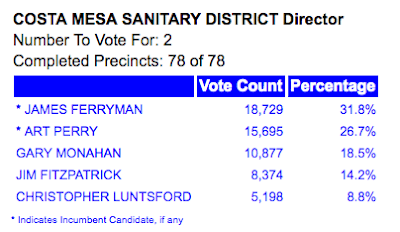 Incumbents Jim Ferryman and Art Perry continue to hold commanding leads in this race. Former member and former councilman Gary Monahan is far behind Perry - 4,818 votes. 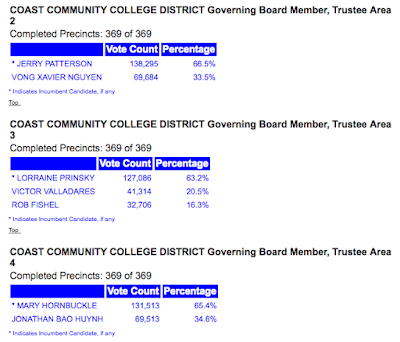 Jim Fitzpatrick and Christopher Luntsford are far behind. 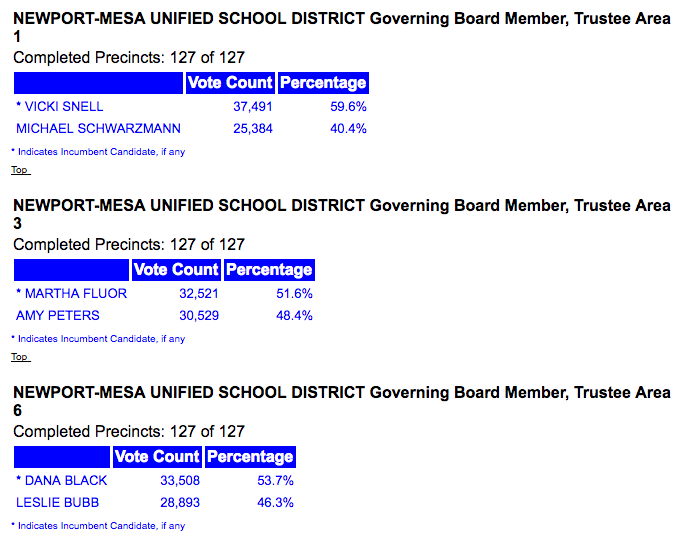 Incumbent Jim Fisler continues his dominance of this race, leading Alex Reich by 1,509 votes. The citizen-generated Measure Y, the Smart Growth Initiative, continues to hold a more than 2-1 lead. City-generated Measure Z, designed to hoodwink the voters is passing, but with 5,288 fewer votes that Y.
Citizen-generated Measure AA holds a more than 2-1 lead. Measure BB, the other City-generated measure designed to fool voters, is failing badly. Both citizen-generated medical marijuana measures are failing at the ballot box. Measure X, the City-generated measure is passing. This measure, hijacked by Mayor Pro Tem Jim Righeimer to create 6 districts and add a directly-elected mayor to the mix, is passing by nearly a 2-1 ratio. This meaningless measure, designed to confuse the electorate about Mesa Water's hostile takeover of the Costa Mesa Sanitary District, is passing. Big deal..
All incumbents in these races are dominating their challengers and will hold their seats. Matt Harper will defeat Karina Onofre. John Moorlach will defeat Ari Grayson. Dana Rohrabacher will defeat Dr. Suzanne Savary. HAPPY THANKSGIVING FROM A BUBBLING CAULDRON! Thank you Geoff for posting and posting and posting etc. 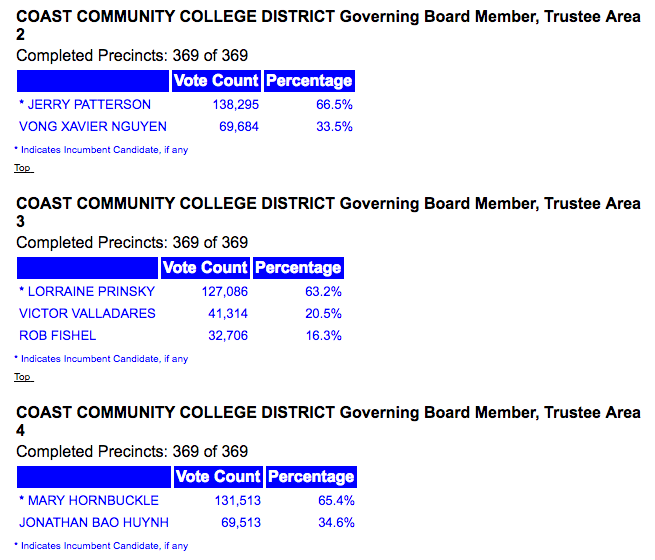 all the local election results. And staying up late if necessary to keep us informed of all the local news. You are on my Thanksgiving list of people to be thankful for. A Bubbling Cauldron is right up top of things to give thanks for. Your blog is the main source for constant dish and accurate news to the community, about the community - seasoned with your own special flavorful sauce! And Thanks to your patient and loving wife. Good think she is, 'cause she'd sort of have to be. Happy Day of Thanksgiving to you both! Robin, thanks. I just write. You and the CM4RG crew plus all the other volunteers who care enough for the future of our city to actuall DO things to improve it. I am VERY THANKFUL for you all.